Welcome to the School of Philosophy. Philosophy is essentially the study of those questions for which science has not given us an answer. But ideally philosophy may question meaning and "love of wisdom". Philosophy concerns itself with such issues as the nature of reality, the existence of a higher power, ethics, logic, and the question of what we can really know. If there is a historical period of philosophy, a particular philosopher, or a school of thought that you think should be covered here, and isn't, please feel free to create a page for it, add whatever content you can, and link to it from within the appropriate department. Divisions and Departments of the School exist on pages in "topic" namespace. Start the name of departments with the "Topic:" prefix; departments reside in the Topic: namespace. Departments and divisions link to learning materials and learning projects. Divisions can link subdivisions or to departments. For more information on schools, divisions and departments look at the Naming Conventions. Note: there are additional philosophy pages that need to be imported from Wikibooks. The scope of the department of philosophy is discussion of an array of philosophical topics at various levels of competence; the development of competent, accessible expositions on a wide array of philosophical topics (the topics discussed shall be at least reflective of current philosophical thought and any topics out of the mainstream shall be required to include any charitable mainstream critiques of the topic), the development of a comprehensive listing of philosophical resources on the internet, the development of a departmental forum for the discussion and debate of policy, content, community. The department of philosophy aims for the highest quality philosophical forums and resources in the world. Community shall be the highest priority of this department. Everyone is encouraged to contribute to departmental discussion and exposition. All that is required for successful contribution is compliance with policy. Policy can only encourage accessibility and clarity of content. Policy shall not censor any viewpoints. Members may discuss critiques of any views. By allowing critique, exposition facilitate expositions which are neutral. Expositions shall be aimed at level typically expected of students at the tertiary level. Learners of any age and skill level can utilize discussion groups. If any particular exposition leads to any questions, the department encourages the learner to post all questions on the skill-level appropriate discussion group--as a community we will respond to questions. Note: Areas are available for the beginner and intermediate competency levels. Your edits in any area of advanced studies shall reflect an awareness of the departmental by-laws, history of philosophy, meta-philosophy, and major trends in contemporary philosophy. 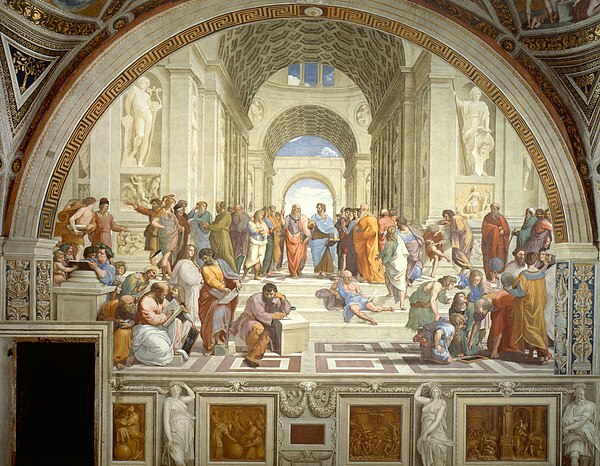 Historical Introduction to Philosophy - This is an Introduction to Philosophy course designed by the students of Mesa State College. It is constructed from a historical/topical view point. Please click the above link to access our project. I propose that the following list be doubled so as to include an external link where the reading material may be found online for free. If this list cannot be made so, perhaps an additional list should be compiled. This would make it much easier to 'get started.' Thanks! Philosophical analysis in the 20th century, volumes I and II by Scott Soames. A History of Philosophy, by Copleston, Frederick, (1946-1975). Great Britain: Continuum International Publishing Group. ISBN 0-8264-6948-5. This is the gateway for information about the courses and philosophy in general. We hope that its size and scope will increase dramatically as participation in the School increases. We welcome input from all philosophies and philosophers. 1 October 2014‎: Philosophy lecture started! 8 March 2013‎: Theory lecture started! 4 November 2011‎: Logic lecture started! 2 November 2008‎: Metaphysics lecture started! 6 July 2007‎: Knowledge lecture started! 21 February 2007: Ethics lecture started! 16 February 2007‎: Epistemology lecture started!